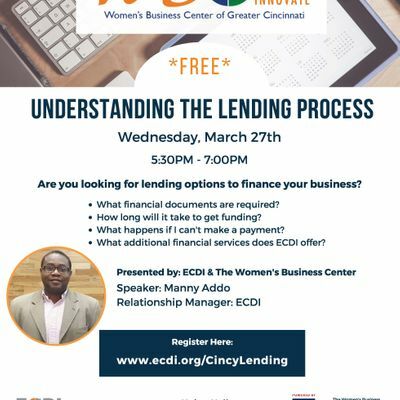 Join the Women's Business Center and Manny Addo, Relationship Manager of Economic & Community Development Institute in a training workshop to understand what is required for the lending process through ECDI for small businesses. This workshop is meant for entrepreneurs looking to start a business as well as small business owners who are looking to expand their services and products. The Economic & Community Development Institute is a Columbus, Ohio-based 501(c)(3) non-profit economic development organization founded in 2004. As the third largest US SBA intermediary micro-lender and a U.S. Treasury designated Community Development Financial Institution (CDFI), ECDI's mission is to invest in people to create measurable and enduring social and economic change. The new office of ECDI opened in Cincinnati in January 2018 and now is providing services and small business technical assistance and loans in the community.